With the decline of the Roman Empire and the withdrawal of its forces from Britain to fight battles against invading barbarians upon mainland Europe, Britain slumped into a dark age of great uncertainty. The absence of the Romans had created a power vacuum whereby warlords and local civic authorities were fighting for pre-eminence. The economic situation reflected the political reality, while Irish pirates, Picts from Scotland and Anglo-Saxon invaders were harassing the lands of the native Britons, (the ancestors of the present-day Welsh), and making deep inroads. Of particular concern were the Anglo-Saxons who were leaving northern Germany and settling in Britain, killing and pillaging wherever they went, making room for their new settlements and driving the British survivors towards the hills and mountains of the island. In the process, destroying much of the Celtic and Christian identities of Britain, churches were razed and their contents were looted. Paganism once again became the predominant religion in peoples’ lives, and given the unstable socio-political and economic circumstances, widespread bloodshed and genocide became the order of the day. Nevertheless the preservance of culture, learning and civilisation remained as a flickering hope for a better future, like a candle struggling against the wind, within the great monastic settlements of Celtic Britain. There remained until a time that the Almighty deemed suitable, that the Lights of Faith and civilisation would re-emerge and engulf the pagan Anglo-Saxons (English), and thus witness the Church which was established by Joseph of Arimathea and Nicodemus the Pharisee, watered by the blood of St. Alban, would once again shine forth with new luminaries of the Christian Faith. The task was not an easy one, since the Anglo-Saxon invader believed that Christianity as well as the language and culture of the native Britons, was inferior to their own beliefs and customs, for they were the conquerors and the Britons were the defeated slaves. The Britons themselves resented with immense hatred the invader who had killed and dispossessed them of their lands and holy sites, and were loathed to associating with them due to the continual breaking of treaties and the invaders’ greed for land and plunder. Yet the Lord who works wonders and miracles brought more settled times upon Britain so that this unique island could be re-evangelised through the enlightenment of the English. Thus a concerted effort was made by Celtic missionaries to help resolve the tensions of Britain’s socio-political situation through establishing a common faith for the Isles which would promote tolerance and learning amongst all peoples of Britain. Regretfully for quite some time, the process of evangelisation had failed dismally for one reason or another, and it is into this context which our Blessed Father amongst the Saints, Aidan of Lindisfarne, arrives unto the scene of our account. Aidan, was born in Ireland, possibly around Connaught, in about the early seventh century, and later became a monk on the famous monastic island centre of Iona, off the west coast of Scotland. It was here in 616AD that St. Oswald, found solace after the death of his father, King Ethelfrid of Bernicia, on the battlefield against the East Anglians. In those days England was not a single nation, but consisted of seven independent kingdoms, of which Bernicia belonged to the Kingdom of Northumbria. During this time of exile, Oswald was inspired by the simplicity of the monks’ lives, their exemplary conduct and their dedication to learning and asceticism, while observing carefully the rhythyms of Iona’s ascetical life. He in turn sought to be catechised and baptised in the Faith, and began to live the ascetical life. However the other reigning King of Northumbria who represented the province of Deira was killed by the cruel pagan king of Mercia, Penda and his allies, who wrought immense destruction upon the people of Northumbria. At the age of thirty (634AD), Oswald set out to liberate his nation with a very small army of trusted men to confront the overwhelming armies of the Kingdom of Mercia and their allies, at the field which was providentially named the “Field of Heaven” (Hefenfelth). According to his own account on the day of the battle he obeyed a vision of St. Columba who had commanded him to make a wooden cross and fix it at his side of the field in order to secure victory. Victory was secured as St. Columba had promised, and so St. Oswald went about reuniting the Kingdom of Northumbria and extending its influence well beyond its borders. Acknowledging that this power had been bestowed by God, he sought the help of the monks from Iona, since the death of St Edwin had deprived Northumbria of a great witness of the Faith. Due to his familiarity with the Iona brotherhood he felt that he could depend on them to carry out this task of evangelisation effectively, since he had no contact or recourse with the recently established Roman-backed monasteries of Pope Gregory that existed in south-east England. Thus the monks made preparations and sent a new bishop named Corman, accompanied with a small retinue of monks to assist him in his efforts within Northumbria. 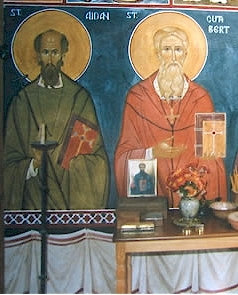 However, Corman’s efforts were unsuccessful and returned to Iona bitterly, complaining that the pagans of Northumbria were too resistant to the Gospel and too hard-hearted. As the monks were deliberating as to what to do next, Aidan spoke up. He said, to their surprise, that the fault was not with the pagans, but with the preacher sent to them, and that his methods were too rough and inflexible. He asserted that the pagans must be treated with gentleness, fed with the milk of mild teaching and encouragement before they could be ready for the meat of the Gospel. In this way Aidan recalled the words of the inspired Apostle, St. Paul, whose exhortation to the Jews in Hebrews 5:12, read as such: “For though by this time you ought to be teachers, you need someone to teach you again the first principles of the oracles of God; and you have come to need milk and not solid food”. It was this contention that Aidan put forward before the brothers, that one could not expect a person who knew next to nothing about Christianity to embrace the fullness of faith in one go, for how can one know if they have not tasted or known that “the Lord is good” (1 Peter 2:2). Let alone appreciate or make sense of deep theological nuances of Christian doctrine. The monks recognized Aidan’s qualities of being a true pastor and evangelist, and so they appointed Aidan to go to Northumbria in the stead of Corman. As Aidan or the monks who accompanied him initially did not know the language of the Northumbrians, King Oswald travelled with them as their benefactor, translator, and friend. 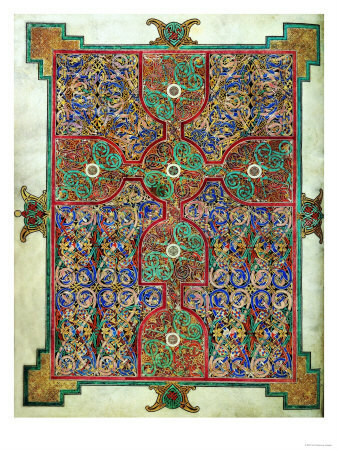 Hence in the year 635AD Aidan was consecrated as a bishop, so that he could better establish churches wherever he went. King Oswald bestowed upon him the island of Lindisfarne which was situated near the royal palace at Bamborough (Bamburgh). 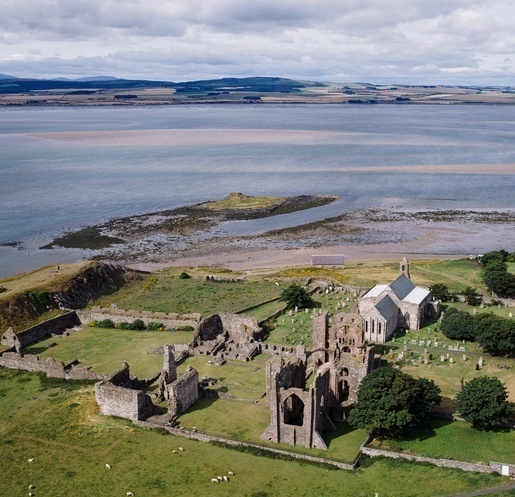 This island off the north-east coast of England (just south of today’s Scottish border), was established as a monastery in accordance to the Celtic tradition, and served as Aidan’s episcopal headquarters. As the early English historian the Venerable Bede says, “As the tide ebbs and flows, the island of Lindisfarne is surrounded by sea twice a day like an island, and twice a day the sand dries and joins it to the mainland.” It was the perfect place to find monastic solitude, being both accessible to the world and inaccessible too. On Lindisfarne, the monk-bishop Aidan could seek God in uninterrupted holy stillness, and then go forth easily on his missionary journeys. 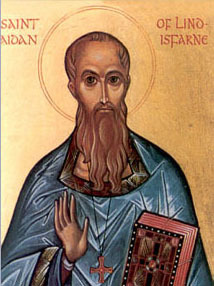 Eventually Aidan established on Lindisfarne a school for monastic missionaries, training young English boys to preach the Gospel to their countrymen in their own language. Yet he had his eye on the future of the Church of Northumbria to truly be a local Church served by its own, with the hope that a Northumbrian would succeed him as bishop. His ministry became a peripatetic one, whereby he would be accompanied by a group of clergy and monks who together with him, would maintain the monastic observance of life, whether preaching in public places or visiting people within their homes. Even though he travelled with the bounty of the king, Aidan humbly insisted on continuing to conduct his ministry on foot no matter how long the journey was. He refused to allow himself or his co-workers to succumb to putting on airs, and refused the trappings of royal splendour. According to his view, to live in great poverty assisted the monastic to attain complete detachment from earthly things which bestowed freedom upon them, as well as the authority to reprove the rich and powerful, (since they were not as easily cajoled by them). Rather, Aidan sought to meet the people where they lived, both geographically and spiritually, and would walk the weary miles to meet them in their homes as an equal, and as a friend bringing Good News from afar. Aidan lived a life rooted in the Scriptures, and he encouraged those travelling with him to spend their time reading the Scriptures and committing the Psalter to memory. He found his delight in God and would often slip away quickly after a meal to spend time in solitude, reading the Scriptures and praying. God assisted Aidan, and he had great success, making converts to Christ and establishing monastic centres and churches throughout northern England. He would assign monks to remain in these new establishments to help ground the people and look after the poor, the needy and the children of each place. One essential key to Aidan’s success was the humble love and compassion he had for all people. He refused to acquire wealth, but gave away all that he could. If someone gave money to him or his monks, they used only what they needed for their necessities, and gave away the rest to the poor or used it to free slaves. Quite often the spiritually mature of these people who were in great need were exhorted to prepare for priesthood and undertake theological formation. 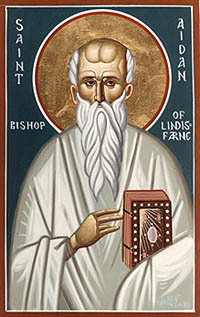 St. Aidan’s heart belonged to the poor and suffering of the earth. In 642, Aidan’s friend King Oswald died in battle in his thirty-eighth year. Aidan grieved greatly at the loss of his friend. However, King Oswin of Deira succeeded Oswald, and Aidan came to love him just as dearly. Bede tells the story of how King Oswin gave Aidan a fine horse to ride whenever he had to cross a river or travel quickly on an urgent errand. Yet not long after receiving this bountiful royal gift, as Aidan was riding somewhere on the king’s horse, he met a poor man asking for alms. Bishop Aidan immediately sprang from the horse and ordered that it be sold with all its rich trappings, and the money given to the beggar. The king, a man of piety himself, humbly received the gentle rebuke, turning it over in his mind as he stood warming himself by the fire. Pricked in his conscience, he impulsively went over and knelt at Aidan’s feet, saying, “I will not refer to this matter again, nor will I ask how much of our bounty you give away to God’s children.” Aidan, deeply moved, raised him to his feet, assuring him of his love and begging him to sit down to eat his food without regrets. Aidan’s words proved to be prophetic. Civil war broke out and King Oswin was soon murdered in battle by his rival and successor. Aidan departed this world a mere twelve days later, dying, some said, from grief over his beloved royal friend, on August 31, 651. He was buried in the cemetery at Lindisfarne. Aidan was, even in his earthly life, a wonderworker. The faithful told stories of how he predicted a storm at sea, and gave the sailors who would be caught in it some holy oil to pour on the water and calm the storm. Another account relates that during times of prolonged austere fasting like Lent, he would retire to the deserted island of Farne to dedicate himself to undistracted fasting and prayer. It was during one of these retreats that he witnessed a fire being lit by King Penda of Mercia that threatened to engulf the town and palace of Bamborough, and he immediately raised his hands to heaven, invoking divine help with tears. At the same instant, the wind changed direction and the flames turned against the besiegers who were forced to retreat. O holy Bishop Aidan,/ Apostle of the North and light of the Celtic Church,/ glorious in humility,/ noble in poverty,/ zealous monk and loving missionary,/ intercede for us sinners/ that Christ our God may have mercy on our souls. 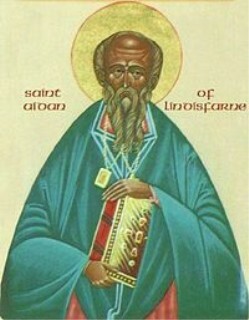 Thou didst teach and preserve Christ’s doctrine/ and didst spread the faith throughout Northumbria, O holy Hierarch Aidan./ Unceasingly pray to God for us/ for thou dost worship before His throne for ever. Dedicated to Father Elias Kentrotis, a beloved spiritual father who has sacrificed much (especially his own health) for the benefit, service and grounding of many believers within the Faith of Christ; who otherwise would have never have come to know Christ, despite being baptised in the Faith, while those who sought out Christ found a patient and loving guide. – V.M. Hello! eefefkd interesting eefefkd site! Thank you for this article. I was at Lindisfarne in 1999. We just planned started a “parish in formation” named St. Aidan’s.